"A big girl with big threats." - Dupin and Jecca brought him back to life and they're the BEST. No, Dupin, no tail on my stomach. - Talked with Kato, found out he'd seen his body. Promised Kato he was going to take care of it. - Sat with Hraustr, intent to pester him about his sword situation, also saw cool new friend maybe? But they were sleeping as far as he was aware and for once minded his manners. - Got his skin back... AND the feather. Put a beartrap in Octavia's den under the furs. 4/15/2017 - Traveled to the forest last night and swiftly found Dupin among some other youths. He greeted them and sat with her. Eventually he made a suggestion to her that they should go find this guy he's seen chased around the forest a few times. Thus they went to go pester Ioten. However, rather than getting chased as he'd hoped, it turned into a conversation. Dupin eventually took over and they learned he had been the one to kill the mute, white fawn's parents. Dia had also been with them, listening and unlike the two terrible children she was hanging around with, she was upset by this fact. Today, he did manage to find trouble in the form of pestering Octavia. He began to talk to her in his typical, mannerless way and she quickly got uppity, turning to threats. Unfortunately, he enjoyed being a pest and only was more rude to her, hoping to stir a game of chase... What he considers a game when really someone is trying to kill him. He enjoyed bandying insults back and forth, but he decided he wanted her to come for him, thus darted and yanked out a tail feather. Rather than high tailing it out of there as he should have, he underestimated the threat she presented, not yet used to the vast differences in strength between himself and other members of the forest. Thus, when she struck him, he felt bones break. A blow to his pride and a wake up call, he realized the forest could present a real danger. Unfortunately, it was too late, as he was unable to flee. Regardless of how aware he was of his likely fate, he laughed and went at her as best he could. He chewed her legs up since they were within his reach, but eventually his throat was torn out. 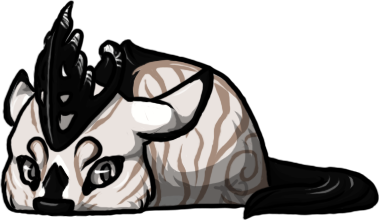 He was skinned after all movement ceased and Octavia raged about her feather. His body was drug off and tossed into the muddy shallows of the pond. 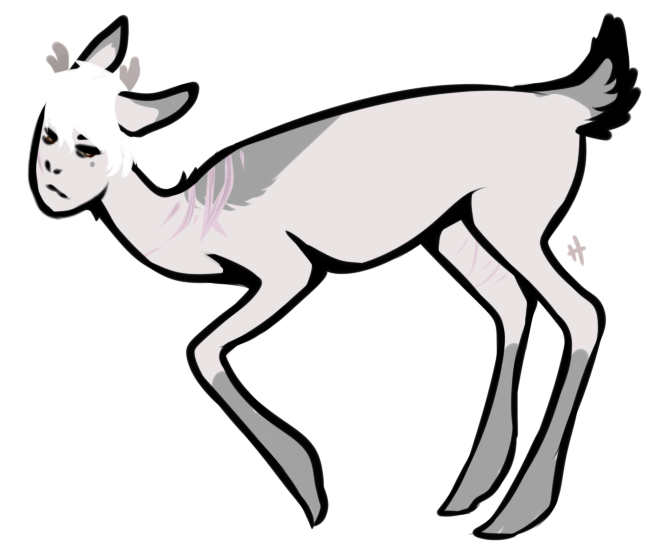 Ichor stole one of his hooves and his little skinless tail. Kato also found his corpse. Fletcher and Liathe were then kind enough to make him a small grave. In the evening, Dupin came by, looking for him and discovered his grave. She dug it up and using some fairy dust from his remaining pouch, took his lighter body home to her mother for some Frankenstein nonsense. 2/19/2017 - Over the past few weeks, he has been spending much of his time in Dupin's company, occasionally visiting Kato and Ross as well. He met a pale little child and gave him a feather because he looked lonely and later a journal since the kid could write, and that was cool... And he had a few sitting around his home that he'd made but would never use. Spoke to a cool lady with giant wings as well. After Valentine's day, he gave a few people kisses because he didn't have chocolate and his idea of Valentine's day is not really accurate, only loosely based off of what he saw back a century ago in London. Yesterday and today were spent with Dupin, though she was asleep yesterday, so he talked to her big guardian, Silver. Who he thought pretty weird... But managed to earn the Lost Boy Seal of Approval™. Today, he found her by the crying idol sleeping, and woke her up with no manners. Found out she had been pushed there, thus helped her out. Questioned her about how she got there and what was wrong with her leg. Believed he got sufficient answers and spoke about a few other things before he dozed off like a champ and slept through everything and got very upset with his player for going around, also like a champ. 1/29/2017 - Foxtrot entered the forest with intention to impress Freyja and vaguely to impress Rúna with his self taught abilities of survival. Unfortunately, neither girl was impressed and parents were brought up which happens to be a very sore topic for the vulpine youth. It swiftly turned into irritation for the lost boy with a faintly caught comment and a quick suspicion that the girls were simply bullies. Had he been in human form, he would have been glad to teach them a lesson, at least in his opinion. However he realized his disadvantage and commented that they weren't worth it and trotted off to seek out Kato whom he stared at for a while before the blue giant left. Eventually, he sought Dupin and found the girl with a new family which stirred notions of jealousy he promptly denied the existence of and sat with her when she came away tonchill with him. He greeted a feline before sparking up another conversation with the smaller child. Helped with some notions of vengeance against the bigger kids and learned that she could be brought back from death which he found incredibly impressive. Also spoke about the small kids behind them and impressed upon her they would get in trouble if they were the cause of the little ones coming to harm. At some point he ended up admitting to the fact that he had no family as was for some reason unable to tell a lie. 1/24/2017 - The child has been sitting at the spot be had caught Ross frequenting and spending some time hunting. He was on the look out for Kato as well, but had yet to catch any sign of he or Galene, thus is a bit worried. Today, he met two girls, with strange accents. 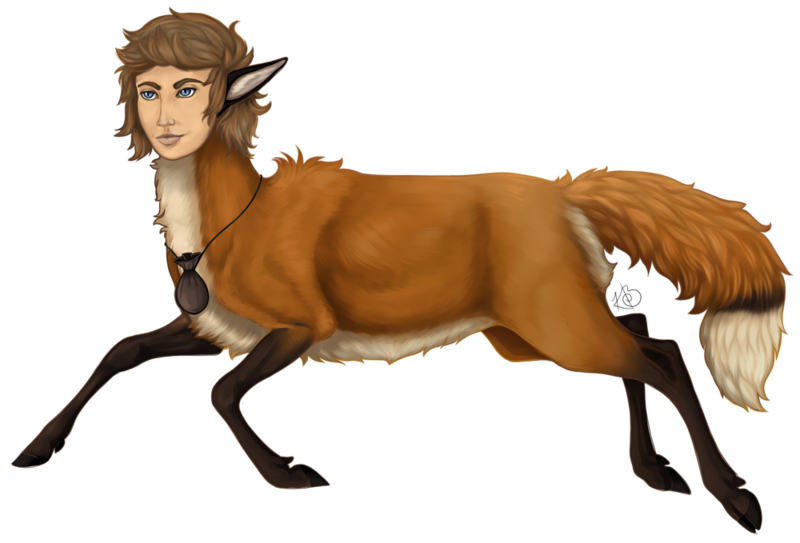 He talked to one while the darker made a few insulting comments that would have sparked a battle of insults until Freya made the fire mistake of calling Foxtrot a man, never mind perhaps insult his fairy magic. Shouted briefly and asserted himself as a boy and that he would never grow up. When she insisted adults were necessary, denied such with his his self sufficient life style. His ego nearly exploded, but his point was made, at least to himself. He plopped down with Dupin as the girls left and sprinkled the smaller child with fairy dust and sparked a conversation about magic and flying. They exchanged names and Foxtrot kept his mouth shut on his opinions on parents when Dupin's mother was mentioned. Then the topic of fighting came up some scar and stories were shared. The boy was impressed by Dupin's scars thus far. 1/22/2017 - The youth entered the forest today, looking for entertainment, as he often did. He played with a fawn of the typical Forest variety for a few minutes before it ran off and he found himself wandering aimlessly through the birch, floating through trees and into the bows to grab a squirrel snack and sit on a branch as he ate and skinned it, cleaning the bones, as he wanted to use them for years and decoration. He snagged a rabbit and stuff it away for later. He used snow so it would stay fresh. The fox was not terribly impressed by the weather changes but was pleased that he was at least well equipped for it with his fur coat. After some frolicking and wandering, he happened upon Ross and immediately addressed the myling and his assumed absense from the child's point of view. Foxtrot noted Talla, Duping, Fletcher, and Liathe, but at the moment was singly focused on Rossamund, and happens to be a rude child. Asked a few questions and was prepared to instigate play after stating he would make a trinket for Ross when little Acobol caused his attention to shift. He stared at the snake child before approaching and attempting to entice into play, not terribly concerned about the bandaged state of the younger. However, after so, and some uneasy moments, he picked up that perhaps the younger child may be in pain, thus slowed down and draped his tail over the other while doing some investigative sniffs. At contact, Acobol became obsessed with his tail and tried to take it. This did not work as his tail is very much attached, but it did not feel good and caused the elder child to help and sit down. Foxtrot relaxed as the other relented for a moment until his tail was then bitten very hard in an attempt to removed it. The Fox growled at that point and shouted, "That's my tail!" 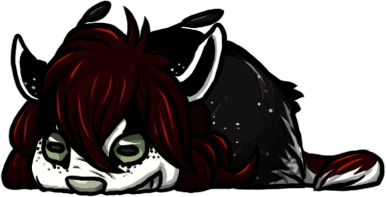 Acobol was upstairs, so with a huff, he let the younger continue to play with his tail, which was still nipped, and fiddled into, but not in a manner to detach it from his body now. Foxtrot was not a fan, but tolerated it for the sake of one younger than himself. Well played, Acobol. Well played. Foxtrot finally has CSS! Done by Cissy! Ty~ I'll fill more out as I go along... Can't explain personalities. Foxtrot is a unique child in the forest. No particular quality makes him stand out, but his mix of traits is rather interesting. He is independent to a problematic degree. If he has an opinion on something, it is often quite difficult to change it. While accepting of gifts, he is unlikely to accept help it is presented as such. However, he is far more gullible than he will admit, thus it would not be terribly hard to assist him if one were clever about it. Insults to his ability to support himself or implications he cannot are likely to be taken harshly and result in his irritation. His independence often leads to him thinking he is rather wise to have made it quite so long on his own. Thus, while unaccepting of other's help, he is frequently quite willing to offer his own to others. A playful mischief shows up almost immediately upon meeting Foxtrot, tied into his blatant ignorance of manners. The moment he is comfortable around somebody, he is liable to start pulling pranks or intentionally pestering them. Of course, strangers, are not exempt from this. He is not malicious in this, even if he may be a bit rough. He considers it all very good fun and expects to receive similar treatment back, hopes for it even. He takes very little personally in this regard and would not expect others to. He has forgiven broken bones minutes after they have occurred. Bruises are common, on himself and his playmates, even bite marks. At his age, despite how well equipped for the world he may claim he is, he is still very much a child, immature, and not ready to deal with certain things properly. He may be older than many adults of the forest with experience in numerous areas, but his interests are still that boy. Many things elude his comprehension, simply from lacking exposure. He comes from a rather small world, there is much he has not seen and the company he keeps has not taught him much aside from what normal preadolescent might know. While somethings he knows are abnormal for one of his apparent age, he is still quite naive. He is not difficult to trick, rather gullible in the right presence. He could be considered trusting at times. While he rarely hold grudges, when he does hold them, they will defy logic and only lets such go for the most ridiculous reasons. 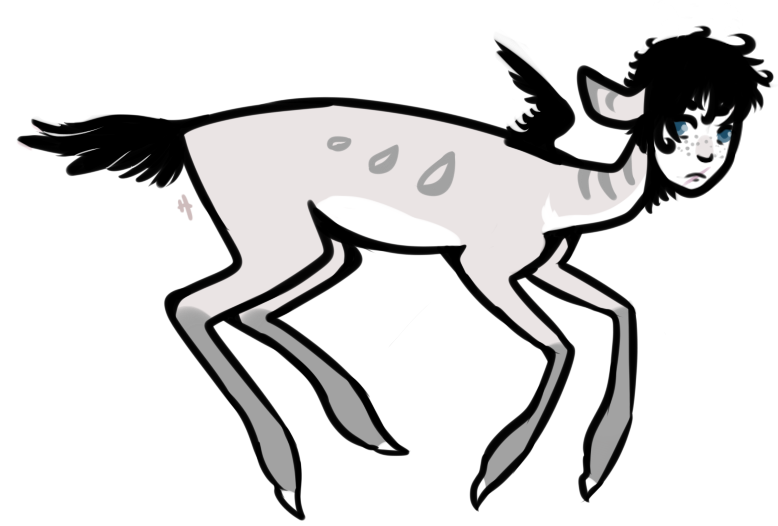 Foxtrot is rather typical of the true Endless Forest deer in terms of overall shape. A young, boyish face is set upon a rather fluffy neck. The fox has brilliant blue eyes, carried over from his human form, but altered with the vertical pupils of a fox. They are keen and he can see well in low light conditions, more sensitive to movement than color, though he is far from colorblind. He frequently wears a smile of mischief that shows off an array of teeth no dentist would wish to go near. Fangs of razor sharpness are embedded in his gums, capable of slicing through even the toughest of hides like a knife through butter. There is little force behind it and his mouth is small, but it is far from recommended to stick anything in his mouth that one wants back. Ears are large and fox like, very sensitive, constantly twitching and as expressive as the child's face. The body of this youth is quite lean and his entire form is covered in the coat of a Red Fox, though the texture is ever so slightly off, as hairs are partially hollow, like that of a Pronghorn. Rusted hues cover the majority of his coat, with a cream underside and tipped tail. 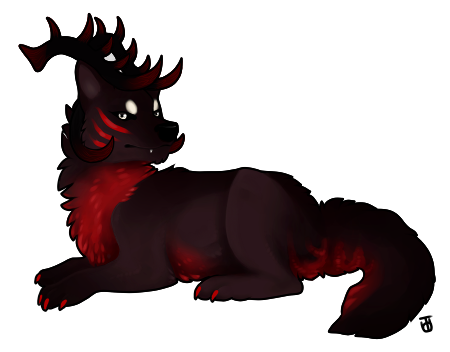 Black forms stockings on all four legs and colors his ears and a small spot where the white joins red on his tail. A bit of grey can be seen intermingled on his haunches. Fur is quite dense and longer on his body. 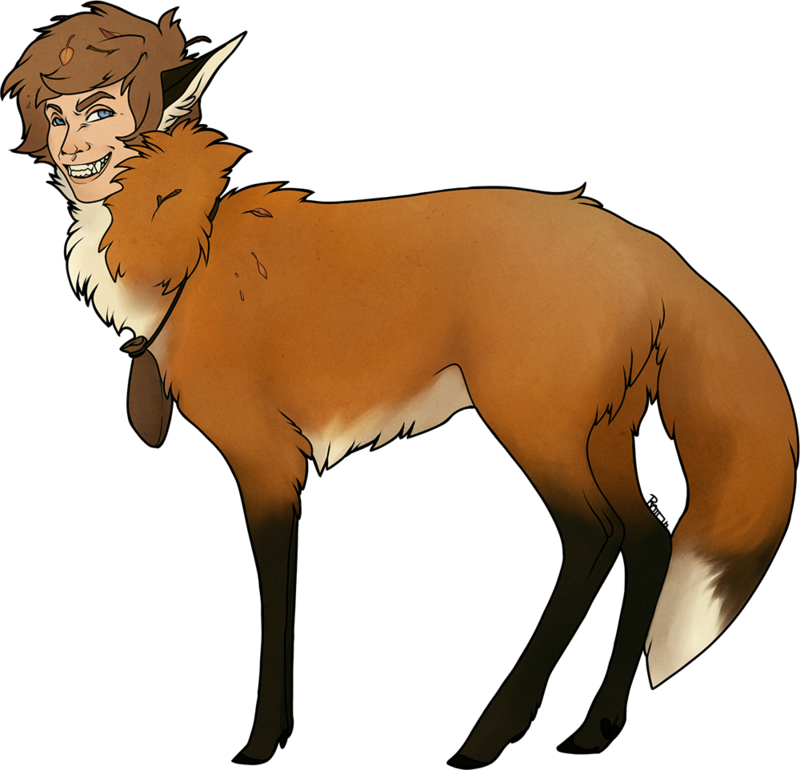 On his neck, he seems to have a thick, warm mane, and his tail is typical of a fox, long and bushy. It is thickest in the winter and keeps him warm, even in harsh blizzard winds. His coat is repellent to water, but can not keep him dry in a deluge. Under the thick fur, the youth is quite lean, well muscled, suited to sprinting at high speeds or jogging for hours. Long legs carry hims effortlessly, and nearly silent due to his easy gait and light weight. 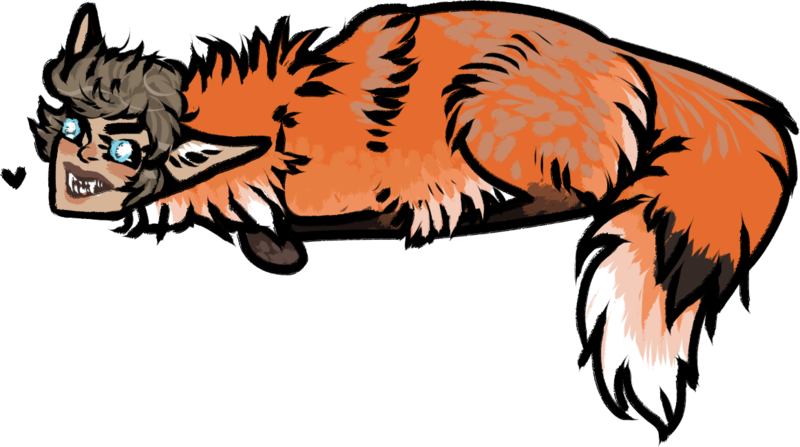 A constant layer of glittering, golden dust seems to cling to his fur and often has him lifting from the ground, floating out of reach. Scars are hidden under the fur, faded from decades ago, thus the fur has grown back to cover and hide the marks of violence on the youth. He is missing a dewclaw on his right foreleg, which coincides with his missing pinky. In combat, despite his apparent age, he does not lack experience. He is not terribly dangerous offensively, but he is a surprisingly strategic and frustrating opponent. 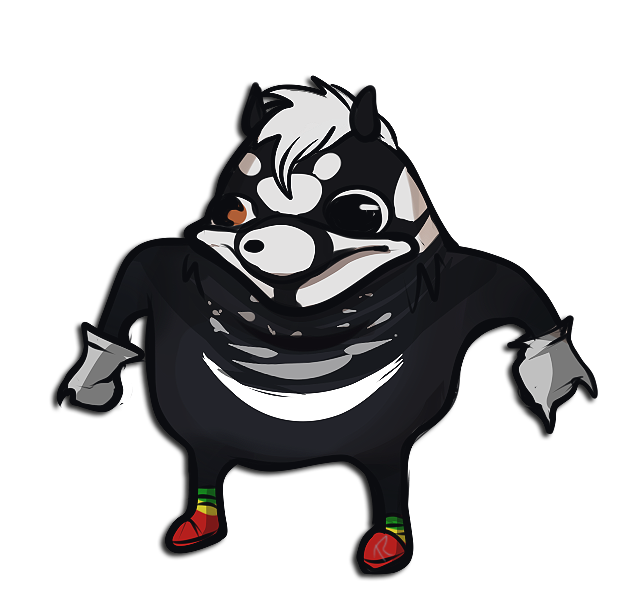 Aware of his small size and lacking strength, he relies on agility and speed heavily, as he is almost always at a disadvantage in any conflict. He will often fly and use dishonorable tactics such as blinding his opponents or insulting to throw someone off balance. He is fast and energy is near inexhaustible, thus when he does run, it is unlikely he will be caught. In the midst of battle, he makes himself incredibly difficult to hit with fast, unpredictable movements and quick darts for superficial bites or hits to vulnerable points. Fighting is fun to him, though, so it unlikely he is ever going for death, only injury. 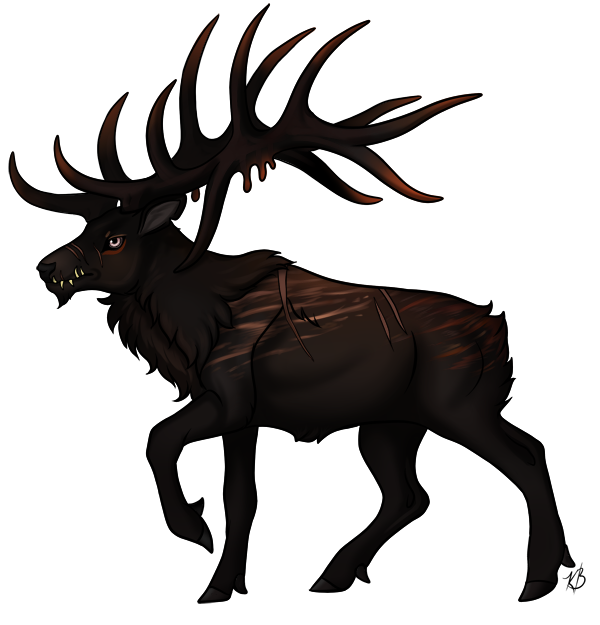  His pelt, skinned by Octavia and stolen back from her den. Best friend and savior as far as he is concerned. She is one of the few with any sense in the forest. Similar interests often have him scheming with her. He is unwittingly not a wonderful influence on her, but thinks he is teaching her good things and vice versa. After his death, she brought him back to life with assistance from her mother and he is endlessly grateful for that, though he does not know how or that he should show it. Kato's friend. Interesting, and while he has spoke to her little, he thinks she is fun, even if she doesn't quite go along with his play as he wants. Also a pretty. Close to a friend. A child but not... 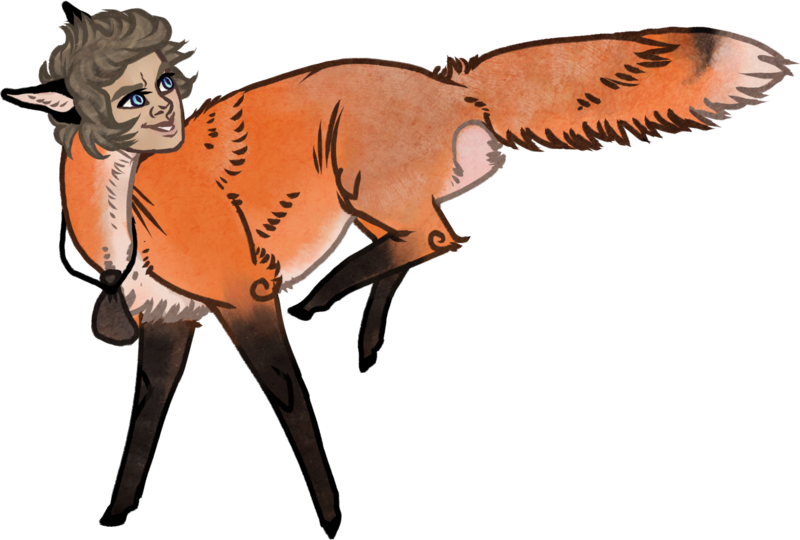 He seems young and the Fox took the Myling to Neverland, so that's SOMETHING. Murderer. She killed him and while in some respects her for succeeding where others have failed, he also wishes harm upon her. He has no desire to kill her, but intends to leave traps and nasty presents for her. He got one of her feathers. He's seen and met so many, I forget! Let me know if I missed you! This biography may contain mature and potentially triggering content. This is may include, but is not limited to violence, child endangerment, and swearing. In the future, it may contain more than that if he does ever make it to adulthood. Foxtrot is a character and his views do not reflect mine. He is almost always in character unless interacting with new players or helping with sets. If you have any concerns, wish to RP, or just shoot the breeze, feel free to add me as AOWACC @ skype. Thank you all for the tracks and interest. That request did not show up on my Skype yet D8 should show up as Rae Day. This is such a cute CSS layout for him. January 27, 2017 - 2:33am — ems.